Yep, I was one of those kids, “Teacher, why do I need to know this?” Teachers thought I was being a smarta–. This is farthest from the truth . . . I really wanted to know. As Danel Pink noted in his keynote, it is a human need to know why. We are meaning-seeking creatures. We seek to understand the reason for almost everything that happens in the course of each day. Why is what drives not only everything we do, but also our emotional reactions to everything that happens to us. We’re simply far more likely to accept a change if we understand the reason for it. Interestingly, our acceptance seems to hinge less on how much we like the reason and more on how much sense the reason makes to us (Why We Need To Know Why). 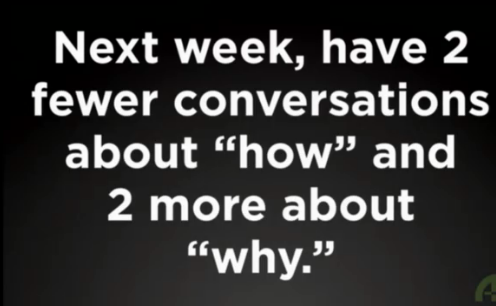 I believe that it is a student right to know the answer to “Why Do I Need to Know This?” about about topic being presented to them in the school setting. Chris Lehmann of the Science Leadership Academy does a great job addressing this in Why Do We Need to Know This? It is the question that many teachers hate to hear from students in their classrooms. Whether it is the format of the Shakespearean Sonnet, the Pythagorean theorem, or why the Periodic Table of Elements is organized the way that it is, kids spend a lot of time in schools wondering why they are learning what seems like a disconnected series of facts and skills that don’t seem to have much importance to the lives they are leading. And from time to time, the bravest of students will screw up the courage to ask that question. Sadly, too often, the answers (when a teacher is even willing to engage with the question) students range from “It is going to be on the test,” to “It will help you some day,” to “It’ll help you get into college.” When really, more often than not, it’s because the subject matter in question is “part of the curriculum.” If a student is lucky, the teacher is teaching that particular thing because the teacher has a real passion for the subject, but even that really doesn’t answer the question in any meaningful way. If we remember that the time students spend in school is supposed to be about helping them to become better citizens, then the question of “Why do we need to know this?” becomes essential to what and why we teach. The questions and answers that follow the asking of the question should and will have profound implications on both our content and our pedagogy. And if we create our learning spaces as places where the question, “Why do I need to know this?” is actually the right of every student to ask, but is the first, most exciting question of every day, we can create vibrant, powerfully relevant classes that engage and empower everyone in it. To take it a step farther, “Why Do I Need to Know This?” is naturally embedded into the learning experience when students engage in interested-driven self-directed learning. This is line with moving from Education 1.0 to Education 3.0 as I discuss in Education 3.0: Altering Round Peg in Round Hole Education. In the case of Education 3.0, the roles become reverse as the learner then needs to articulate the WHYs of his/her studies to the educator and his/her peers.